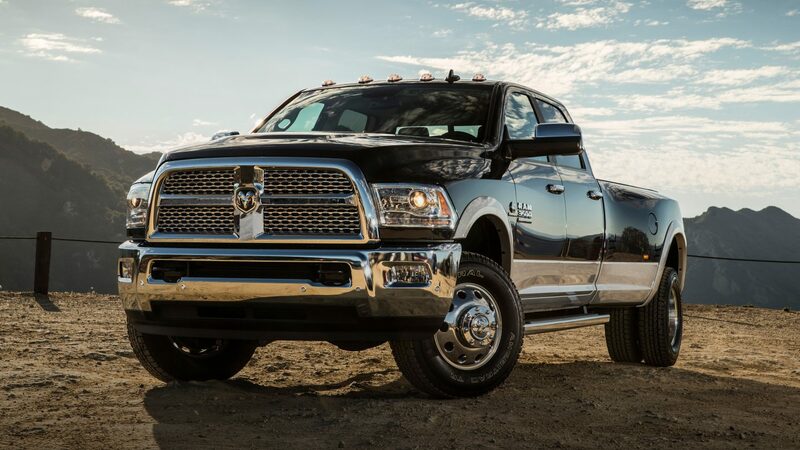 Why lease the 2018 RAM 3500? Among many powerful reasons is that this pickup is a massive workhorse with plenty of pulling power. 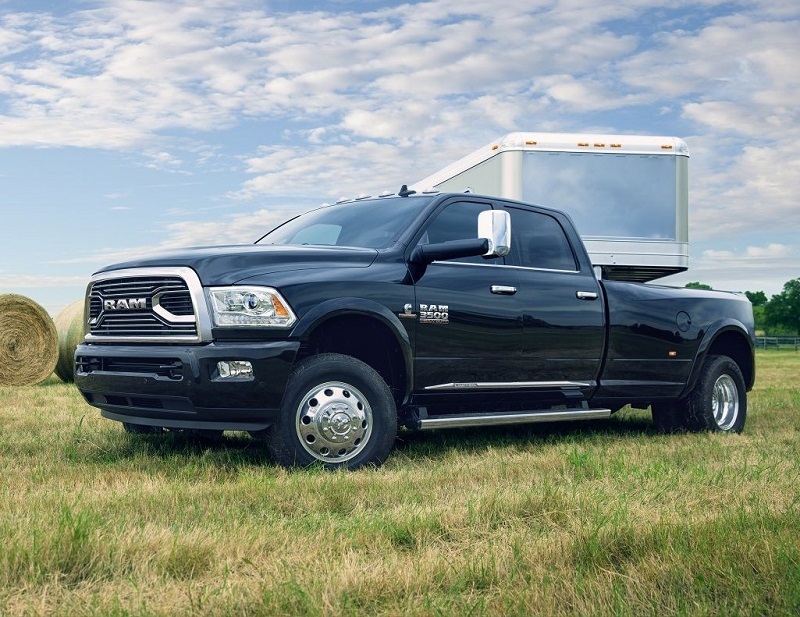 Choose from six trims such as the starting-level Tradesman® or SLT, the mid-level Big Horn® or Laramie®, and the top-level Laramie Longhorn® or Limited. Your purchase is backed by gas powertrain limited warranty lasting five years or 60,000 miles, a diesel powertrain limited warranty of five years or 100,000 miles, and roadside assistance lasting five years or 100,000 miles. Find out which of the following options are available in the trim you want by contacting Melloy RAM in Albuquerque New Mexico, your dealer serving Albuquerque Santa Fe Los Lunas New Mexico. To make loading and unloading easier, the available box rail caps protect the top areas of the cargo bed from dings and scratches. You can add a tonneau cover to secure what you're carrying and improve aerodynamics by allowing air to move smoothly over the body. A cargo-view camera lets you see what's going on behind you on the Uconnect® display. You can continue the job at night with available LED lighting for each side of the cargo bed. You can maximize your carrying capabilities with the available RamBox® Cargo Management System. It puts durable, drainable, secure, and lit storage compartments on the side rails of the bed. Also included are a cargo bed extender/divider and four adjustable tie-down cleats for the cargo bed rails. With the available AllSecure® Central Locking System, you can push a button to lock and unlock these external compartments along with the rest of the pickup. 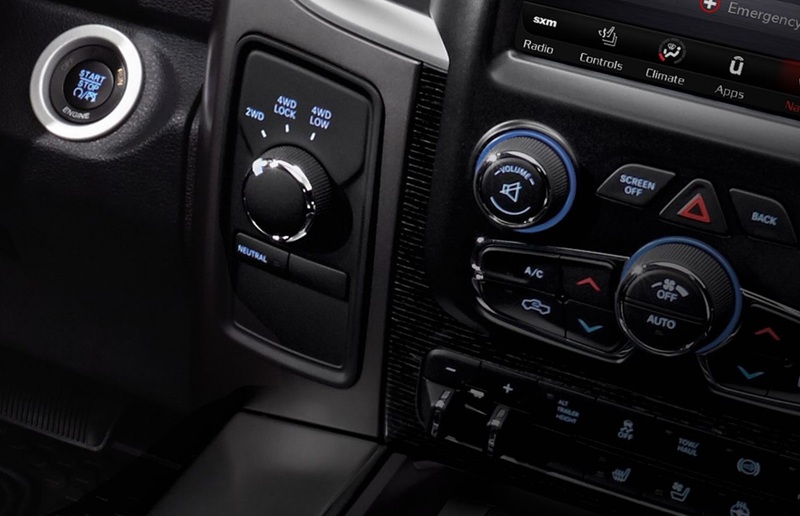 The 2018 RAM 3500 enhances your ride with multiple interior options that include cloth, vinyl, or leather as upholstery, and built-in heating so you stay warm even during the winter. You can fold the bench seat in a 40/20/40 split to allow for more flexibility when carrying cargo. A Behind-the-Seat storage bin and an available rear under-seat storage compartment offer places to secure essentials that you want to keep nearby. An available power 10-way driver seat with power lumbar adjustment allows you to customize your position and store the settings in memory. Your front passenger gets an available power 6-way passenger seat. Keeping you aware and informed is the available Uconnect® 4C NAV system with an 8.4-inch display. Use it to get turn-by-turn directions that can avoid congestion and show the nearest gas stations with the help of available SiriusXM® Traffic Plus and SiriusXM® Travel Link. You get over 150 entertainment choices through SiriusXM® Satellite Radio, which includes commercial-free music, the latest news and weather, and exclusive talk radio. To boost your music appreciation, an available Alpine® audio system impresses with nine speakers that include a subwoofer. While the 2018 RAM 3500 is designed for heavy-duty hauling, you can boost its capacity by gong with the Max Tow Package that includes an improved 30K hitch, prep for a fifth wheel/gooseneck, and the Automatic Level rear air suspension that ensures that your loads or level over any kind of terrain and weight. You can choose from two smart ride heights to align with the trailer and allow better electronic adjustments. The standard three-link front suspension works with both two-wheel and four-wheel drive versions allow for a more cushioned ride, particularly with heavy payloads. The standard rear suspension on dual-rear-wheel models uses separate auxiliary leaves that incorporate higher rates for the second and third stage. This results in superb handling for higher payloads. 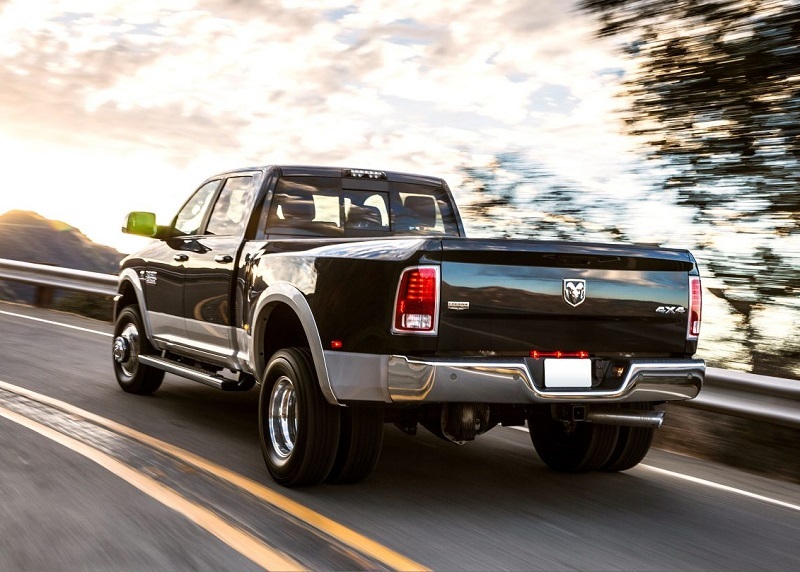 When you engage Tow/Haul Mode, you activate a more aggressive downshift schedule that works well with heavy hauling and the available Cummins® Smart Diesel Exhaust Brake System. You can choose among three engines. The standard 5.7-liter HEMI® V8 relies on Variable Valve Timing to generate 383 horsepower and 400 lb.-ft. of torque while towing up to 17,520 lbs and carrying up to 4,090 lbs. of payload when properly equipped. Greater performance comes from the available Heavy-Duty 6.4-liter HEMI® V8 that relies on two spark plugs per cylinder. It pushes 410 horsepower and 429 lb.-ft. of torque to carry up to 7,350 lbs. of payload and tow up to 16,480 lbs. At the top end is the available Proven and Legendary 6.7-liter Cummins® Turbo Diesel I6 that roars with 385 horsepower and 930 lb.-ft. of torque to maximize payload capacity to 6,720 lbs. and towing capacity to 31,210 lbs. Depending on the trim and motor, you can choose from three transmissions. The six-speed automatic is standard with most of the engines and trims, the AISIN six-speed automatic transmission is available on the diesel engine, and the six-speed manual transmission only goes with the diesel. To make backing up more convenient, the ParkView® Rear Back Up Camera shows live video of what's behind you on the Uconnect® touchscreen. The ParkSense® Front and Rear Park Assist System sends you alerts when you get close to stationary objects in the front and back of the pickup. If someone tries to operate your vehicle without the encoded ignition key, the Sentry Key® Theft Deterrent System shuts the engine down. In case of a collision, you're protected by numerous airbags including advanced multistage versions for the front and supplemental ones for the side curtains. Now that you know why lease the 2018 RAM 3500, experience it in person with a test drive by going to Melloy RAM in Albuquerque New Mexico, your dealer serving Albuquerque Santa Fe Los Lunas New Mexico.